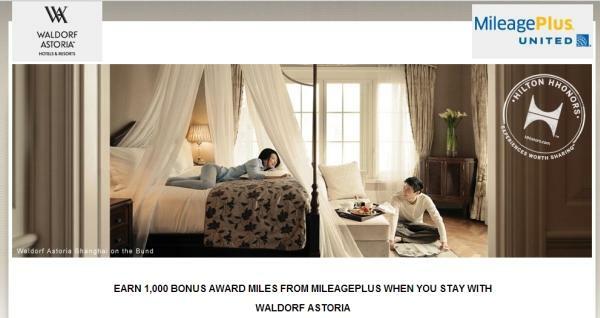 Hilton’s Waldorf Astoria brand is also offering airline related bonuses this fall. You will earn 1000 bonus miles per night with American, United and US Airways or 500 points per night with JetBlu and Virgin America. Please note that this bonus is per night not per stay. All these offers are valid until December 31, 2012, and you need to register for the offer before your stay and have the double dip option set to fixed/variable miles. Hilton has lots of airline related bonus offers this fall. You need to decide if choosing the points & miles is the best option for you. Then you need to decide if the best option is fixed miles (500 miles per stay with AA, UA & US or 250 points with VX) vs variable miles of 1 mile per dollar spend (AA, UA & US) or 1 point for every 2 dollars (B6 & VX). Offer valid for eligible stays completed between September 1 through December 31, 2012 (“Promotion Period”) at any participating Waldorf Astoria hotels or resorts. Specific discounted rate plans, offers or promotions may also be ineligible for bonusing. To be eligible to earn 1,000 AAdvantage® miles night of your stay, you must (1) select American AAdvantage® program as your Double Dip® earnings partner in your Hilton HHonors™ account profile, (2) register online hhonors.com/waldorf/american before your first stay, (3) book an eligible stay online through any Hilton Worldwide website or Hilton Worldwide central reservations; and (4) complete your eligible stay(s) at a participating hotels between September 1 through December 31, 2012. Registered HHonors members will only receive the selected bonus for nights completed during the Promotion Period, regardless of a check-in date before the Promotion Period begins or a check-out date after the Promotion Period ends. Please allow up to six weeks after qualification, and after promotion has ended, for miles to be credited to your account. This offer may be combined with other offers and/or promotions. All American AAdvantage® program rules apply. Offer valid for eligible stays completed between September 1 through December 31, 2012 (“Promotion Period”) at any participating Waldorf Astoria hotels or resorts. Specific discounted rate plans, offers or promotions may also be ineligible for bonusing. To be eligible to earn 500 TrueBlue Points night of your stay, you must (1) select JetBlue as your Double Dip® earnings partner in your Hilton HHonors™ account profile, (2) register online hhonors.com/waldorf/jetblue before your first stay, (3) book an eligible stay online through any Hilton Worldwide website or Hilton Worldwide central reservations; and (4) complete your eligible stay(s) at a participating hotels between September 1 through December 31, 2012. Registered HHonors members will only receive the selected bonus for nights completed during the Promotion Period, regardless of a check-in date before the Promotion Period begins or a check-out date after the Promotion Period ends. Please allow up to six weeks after qualification, and after promotion has ended, for miles to be credited to your account. This offer may be combined with other offers and/or promotions. All TrueBlue program rules apply. Offer valid for eligible stays completed between September 1 through December 31, 2012 (“Promotion Period”) at any participating Waldorf Astoria hotels or resorts. Specific discounted rate plans, offers or promotions may also be ineligible for bonusing. To be eligible to earn 1,000 bonus award miles per night of your stay, you must (1) select United MileagePlus as your Double Dip® earnings partner in your Hilton HHonors™ account profile, (2) register online hhonors.com/waldorf/united before your first stay, (3) book an eligible stay online through any Hilton Worldwide website or Hilton Worldwide central reservations; and (4) complete your eligible stay(s) at a participating hotels between September 1 through December 31, 2012. Registered HHonors members will only receive the selected bonus for nights completed during the Promotion Period, regardless of a check-in date before the Promotion Period begins or a check-out date after the Promotion Period ends. Please allow up to six weeks after qualification, and after promotion has ended, for points to be credited to your account. This offer may be combined with other offers and/or promotions. All MileagePlus program rules apply. Miles accrued and awards issued are subject to the rules of the United MileagePlus program. Please allow 6-8 weeks for miles to post to your account. The MileagePlus program, including accruals, awards and bonus mile offers, are subject to change without notice. Bonus award miles, award miles and any other miles earned through non-flight activity do not account or qualify for Premier® status unless expressly stated otherwise. Taxes and fees related to award travel are the responsibility of the member. United and MileagePlus are registered service marks. For complete details about the MileagePlus program, go to www.united.com. Offer valid for eligible stays completed between September 1 through December 31, 2012 (“Promotion Period”) at any participating Waldorf Astoria hotels or resorts. Specific discounted rate plans, offers or promotions may also be ineligible for bonusing. To be eligible to earn 1,000 Dividend Miles night of your stay, you must (1) select US Airways as your Double Dip® earnings partner in your Hilton HHonors™ account profile, (2) register online hhonors.com/waldorf/usairways before your first stay, (3) book an eligible stay online through any Hilton Worldwide website or Hilton Worldwide central reservations; and (4) complete your eligible stay(s) at a participating hotels between September 1 through December 31, 2012. Registered HHonors members will only receive the selected bonus for nights completed during the Promotion Period, regardless of a check-in date before the Promotion Period begins or a check-out date after the Promotion Period ends. Please allow up to six weeks after qualification, and after promotion has ended, for points to be credited to your account. This offer may be combined with other offers and/or promotions. All Dividend Miles program rules apply. Offer valid for eligible stays completed between September 1 through December 31, 2012 (“Promotion Period”) at any participating Waldorf Astoria hotels or resorts. Specific discounted rate plans, offers or promotions may also be ineligible for bonusing. To be eligible to earn 500 Elevate Points night of your stay, you must (1) select Virgin America as your Double Dip® earnings partner in your Hilton HHonors™ account profile, (2) register online [landing page URL] before your first stay, (3) book an eligible stay online through any Hilton Worldwide website or Hilton Worldwide central reservations; and (4) complete your eligible stay(s) at a participating hotels between September 1 through December 31, 2012. [insert any airline-specific restrictions] Registered HHonors members will only receive the selected bonus for nights completed during the Promotion Period, regardless of a check-in date before the Promotion Period begins or a check-out date after the Promotion Period ends. Please allow up to six weeks after qualification, and after promotion has ended, for points to be credited to your account. This offer may be combined with other offers and/or promotions. All Virgin America Elevate program rules apply.